Exhaustive, overly so, of how naturalists took advantage of how European navies repurposed themselves to scientific research in the wake of the Napoleonic War. Heavy slogging but the chapter on Darwin is well worth reading. The voyages of exploration under Captain James Cook and Captain Robert Fitzroy, in which naturalists such as Joseph Banks, Daniel Solander, the Forsters and Charles Darwin added so much to western knowledge of life on our planet, are well known in the English-speaking world. 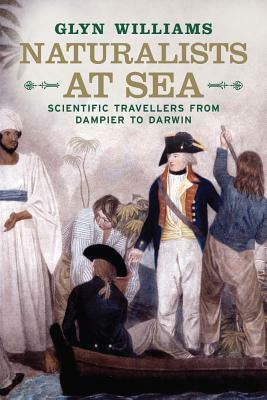 This book extends our awareness to include important voyages of discovery from France, Spain, Russia and Holland in which natural history research formed part of the objective.Professor Glyn Williams is well qualified to write this broad history, being an acknowledged authority on exploration and conflict in the Pacific Ocean, the primary region for these expeditions. He makes clear the difficulties that the naturalists had in all cases. They were usually civilian supernumeraries aboard naval ships, often unaware of resentments against them and their demands from the naval officers whose primary objective was usually a geographical survey of charting and hydrography. Even when a naval officer was acting part-time as a naturalist, there were often conflicts with his captain. Civilian scientists were dismayed at the cramped conditions aboard a sailing warship, with only a few feet of cabin space (usually shared) in which to write, draw and work. Many of these naturalists collected huge amounts of plant, animal and mineral specimens, that were difficult to store aboard in stable conditions. Losses of precious material were often enormous: through shipwreck, through decay or through ignorance and even malice from members of the crew. Even when a collection reached home, bureaucratic negligence or political interference sometimes resulted in years or decades of neglect. Publication of scientific results was often delayed for similar reasons.Very many of these voyages of exploration in the Pacific Ocean were made during the eighteenth century. One can see the influence of 'The Age of Enlightenment' at work at times, in that many of the voyages were protected by international agreement from attack even though the European nations might have been at war. Captain Cook's voyages were recognised as peaceable explorations that added to mankind's knowledge. The French naturalist Labillardière sailed aboard the Recherche under d'Entrecasteaux and when he sent part of his huge botanical collection back to France on another ship it was captured by a British warship during the wars with France. Sir Joseph Banks interceded and arranged for this scientific collection to be released and sent to Labillardière in France.The personal risk for anyone embarking as a naturalist on a prolonged voyage to the other side of the world was great during this age of sail, wooden ships and scurvy. Many of these 'experimental gentlemen' perished in shipwrecks or of disease. Many, such as Menzies and Steller, were soon forgotten.The book is well written for the most part. Just occasionally it could have been improved by a publisher's editor. There is excessive use of the abbreviation [sic] in some quotations. The book is full of interesting quotations, with all the original peculiar spellings, capitalisations and archaic grammar. In most of them [sic] is not used. It would have been better never to have used it. There are many plates of illustration, a good index, eight pages of bibliography and a huge number of referenced end notes. The map of the Pacific Ocean is very welcome and useful, though to follow the expeditions in detail one needs a good atlas as well. I more or less picked this book from the library shelf based on the cover synopsis on the inside cover and the artwork on the cover itself. Very good. Slow reading, but interesting. The chapter on Darwin is particularly good. Glyn Williams - Professor Glyn Williams is a distinguished naval historian and professor emeritus at Queen Mary and Westfield College, University of London. He has been president of the Hakluyt Society and general editor of the records of the Hudson's Bay Company, and has published several volumes on the relationship between the HBC and the exploration of the Canadian Arctic and the Subarctic.He lives in West Malling, Kent.Also publishes under the name Glyndwyr Williams.